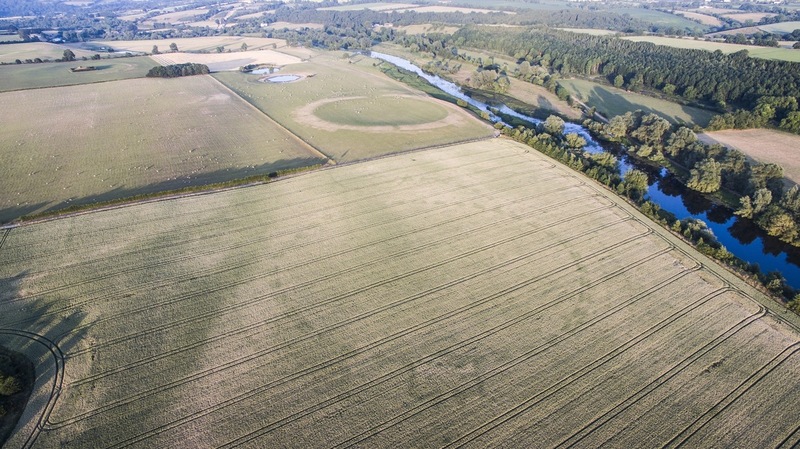 In Ireland, Drought And A Drone Revealed The Outline Of An Ancient Henge As crops get thirsty in Ireland, some plants are faring better than others. 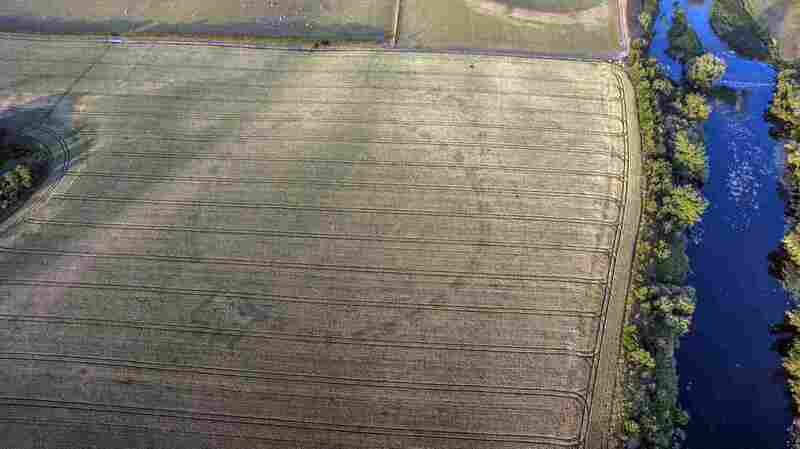 Aerial photos show a pattern in crop growth near Newgrange, believed to be the footprint of a previously unknown henge. Drone footage captured by Anthony Murphy shows the outline of an ancient henge, visible in the pattern of crops grown in a field near Newgrange, Ireland. Murphy runs the website Mythical Ireland (also the name of his latest book), which focuses on the megalithic monuments of the Boyne Valley. He knew the local sites well — every passage tomb, every banked enclosure, every archaeological dig. And he'd been flying drones here for months. He shouted at another photographer, who was flying his own drone nearby, "What the f*** is that?" "I've been telling all the media here that I shouted 'What the hell is that,' but it was actually a stronger expletive," Murphy tells NPR. "When we saw this, we knew straight away, this had never been seen or recorded before." A closer look revealed two concentric circles, the inner one evenly segmented. They immediately sent pictures to archaeologists, who confirmed their suspicions. Murphy and his colleague, Ken Williams, had found the footprint of an ancient henge, or enclosure, that may be some 4,500 years old. In the background you can see "Site P," a known henge in the Brú na Bóinne World Heritage Site. Anthony Murphy was photographing Site P when he noticed something strange in a field nearby — the previously unknown henge visible in the foreground, in the field. The area around Newgrange is a UNESCO World Heritage Site, with a number of ancient and prehistoric monuments, including other henges. The region has been pored over by archaeologists for decades. But this henge was thoroughly hidden, until the drought revealed it. Crops are fading in the drought. And the unusual weather circumstances made the remarkable photos possible, Murphy explains. "In the late Neolithic, people would have built this henge out of timber," he says. Imagine massive posts — possibly whole tree trunks — planted in pits and postholes. "Over time, when the monument fell out of use, the wood all rots away and the holes kind of fill up with organic material," he said. "But they leave a sort of a fingerprint, or a footprint." Archaeologists can see it in soil samples. And, in a drought, you can see the impact on crops. "Those filled-in holes retain a slight amount more moisture than the surrounding soil," Murphy says. "The crop that is growing out of those features has a very small advantage in terms of additional water and it's very slightly healthier." In normal weather, the difference is undetectable — that's why Murphy had flown drones overhead before without noticing it. And even in a drought, it's too subtle to see from the ground. But combine the dry spell with the aerial view, and suddenly the outline is obvious. The photos are intriguing, as well as surprising. There are numerous henges in the Boyne Valley, but they don't have the same pattern of regular gaps that this henge does. "That's not just highly unusual," Murphy says. "It's unique." "This is internationally significant and we now need to figure out what it means," archaeologist Steve Davis of University College Dublin told the BBC. "It has some characteristics that we've never seen before. For example, the very odd double ditch sections." The function of prehistoric henges is a topic of debate, although many scholars suspect they were ceremonial sites. Archaeologist Geraldine Stout told the Irish Times she believes many monuments around Newgrange were built for prehistoric pilgrims, as part of a "sacred landscape." More research would be needed to determine the precise age and construction of this newly discovered henge. The BBC reports that it is located on private land and there are currently no plans to excavate. Ireland's National Monument Service confirmed to the Irish Times that it will be doing "further technical work to help determine the nature of the site." "[F]rom the drone images visible on social media, it is a very significant find which fits within the knowledge of large prehistoric ritual enclosures and associated ritual landscapes as at Brú na Bóinne," the name of the region's World Heritage Site, the service said. Murphy, the writer and photographer who found the site, is delighted — he calls it "a little bit of a miracle" that he uncovered the henge. It was a question of lucky timing, he says. "The last time we had a drought, a spell where we had no rain for this long, was in 1976," he said. "And of course in 1976, there was no such thing as drones, and there was much less emphasis on aerial photography or aerial archaeology ... "
And then, he says, there was the sheer luck of having a grainfield right on top of the remains of the henge. "If there was just ordinary grass in that field," he says, "this thing would never have shown."